The first part of the series outlined the construction of the Asian NATO and described all the ways in which its various members are converging with their anti-Chinese policies in the Philippines. This part of the research speaks about possible scenarios that could happen to offset the organization’s creation, be it by precluding various members’ participation or indefinitely delaying it for as long as possible. One of the scenarios also looks at how the prospective alliance might ironically turn its forces inward by being sucked into a quagmire in Mindanao, which would consequently render them unable to effectively counter China as well as increase the chances that various members decide to abandon the costly coalition. The structure for this section addresses all 5 of the CCC members individually, not counting South Korea or the US. Seoul, as earlier discussed, has yet to commit its interests to the ASEAN region or in countering China, while Washington, as the plan’s mastermind, is incapable of recanting the strategy that it’s already invested so much of its political capital in supporting. This piece begins by pinpointing the conditions that would have to transpire in order to interrupt the participation of the Australian and Indian auxiliary members, before moving along to the core ones of Vietnam, Japan, and the Philippines. Particular attention should be paid to the scenarios affecting the Tokyo-Manilla axis, as this is the most important bilateral partnership of the entire endeavor. ‘Led from behind’ by the US, it’s capable of standing alone and creating considerable challenges for China even in the event that the other three potential members don’t participate. Likewise, the reverse logic dictates that if anything happens to disrupt their ties or destabilize the Philippines as the entity’s host territory, then the Asian NATO would be stymied and could likely dissolve. Before beginning, one should remember that even though these scenarios all play out to China’s ultimate advantage, it doesn’t mean that it has a hand behind every one. This is in specific regard to those dealing with India (Neighboring Crises and Seven Sisters Secessionism), Japan (Public Pressure Pushback), and the Philippines (Election Reversal and Mindanao Mayhem). Instead of Australia being free to interfere in China’s South Sea backyard without repercussion, China could ramp up the diplomatic and economic contacts it has in the South Pacific in order to reverse the dynamic and turn the rivalry initiative against Australia. As noted by the Indian think tank Gateway House in a publication urging the South Asian state to commit more to the region, China already commands much sway in the South Pacific, and this is largely due to Australia’s own history of shortcomings in treating its neighbors with respect. This backdrop means that it’s entirely possible for China to utilize its existing advantages in order to further minimize Australia’s role in the region, perhaps even eventually turning the Pacific Islands Forum (of which Canberra is a member) into a platform for deeper Chinese-South Pacific cooperation, embarrassingly excluding Australia from its own organization and de-facto replacing it in importance. Two key starting points where it could most easily exercise its regional influence are Fiji, which China supported amidst punitive Western efforts to sanction and isolate it after a 2006 coup, and Papua New Guinea, one of the poorest countries in the world and thus capable of being easily influenced for cheap. Bougainville and the Solomon Islands are also prospective partners due to their physical and natural resources, respectively, although China might encounter difficulty working with the latter so long as it continues to recognize Taiwan (although this could quickly change with the right economic enticement). It should be noted that China is already moving in this overall strategic direction, as Radio New Zealand reports that it has given $1.4 billion in foreign aid to ”the Cook Islands, Federated States of Micronesia, Fiji, Niue, Papua New Guinea, Samoa, Tonga, and Vanuatu” since 2006 and has recently pledged to donate more. 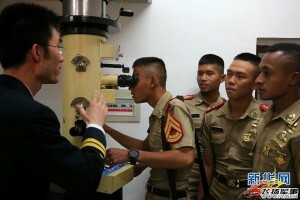 While still a faint possibility, if the circumstances arose where China and Indonesia expressly entered into a strategic partnership with one another, then this would split the Asian NATO’s focus, dilute its capabilities, and potentially even lead to one or more of its members (such as India) abandoning the entire enterprise. The trigger for this happening could be proven Western meddling in West Papua or any other Yugoslav-like attempts to dismember the multinational country as punishment for its pragmatic policies towards China, or as a means of pressuring it to cave in to some forthcoming ploy to enter the Asian NATO. Jakarta would then have the impetus to fully reorient itself towards China out of the existential interest to secure its sovereignty and defend its territorial integrity. This relates to Australia’s participation in the CCC by totally distracting it from any (superficial) anti-Chinese commitments and leading to its absolute dedication in countering Indonesia instead. Once more, the reader should be reminded that this unlikely development could very well usher in the collapse of the Asian NATO and be a total game changer for countering the US’ P2A, but they shouldn’t exactly get their hopes up for it occurring any time soon. India has made it a point to flex its out-of-regional aspirations ever since Modi came into office last year, but if serious enough crises were to erupt in Myanmar and/or Nepal, then this would snap its immediate attention back to South Asia and potentially hinder its ability to “Act East” (depending on the intensity and duration of the crisis/crises). For example, Myanmar could actually see simultaneous ones erupting, ranging from renewed cross-border terrorism to Rohingya secessionism and a return to all-out civil war. Any of these three, let alone their combination in some shape or form, would necessitate an urgent response from India and inhibit the projection of sustained influence past the country and deeper into ASEAN or the South China Sea. The same holds true for Nepal, which appears to be entering into a constitutional crisis over its decision to federalize the country. The latest reports are that India has enacted a crippling de-facto but unacknowledged blockade against Nepal in support of the Indian-affiliated Madhesi people that are upset at what they feel will be their unequitable influence under the federalized system. If the situation spirals out of control and civil war returns to the country, albeit one of an ethnic and non-ideological tint this time (or conceivably even leading to a second communist insurgency alongside the ethnic one), then India would certainly have to put its “Act East” plans on ice in order to prioritize dealing with the refugees and other elements (potentially armed militants) that might continually spill over into its border as the conflict slogs on. In the same vein as the aforementioned scenario, if a serious secessionist crisis breaks out in India’s ‘Seven Sisters’ (it’s Northeastern Provinces), possibly aided and abetted by the cross-border terrorists spoken about above, then there’s no way the country would be stable enough to seriously entertain countering China in the South China Sea. This part of India is notorious for its separatist and terrorist history (sometimes overlapping, sometimes distinct), and if it isn’t stably brought under control and incorporated into mainstream Indian economic life, then it will remain a perennial risk to any sustained “Act East” policy. Right now there’s definitely the very real possibility for increased destabilization due to the combined threats of Bodo and Naga secessionist terrorism, which explains why India has made efforts to so publicly fight back against them. Still, because on-the-ground information from the region is so hard to come by for most observers, it’s uncertain exactly what degree of influence the central government has over the hearts and minds of most of the area’s inhabitants. Ultimately, this means that its ability to maintain peace might be tenuous and ultimately dependent on heavy-handed military measures, which in their own way might perpetuate the anti-government sentiment currently present there and create a cyclical reaction of more secessionism. It might very well be that Vietnam won’t be dissuaded under any circumstances from participating in the Asian NATO against China, but the best that can happen would be to divide its strategic focus and diminish its militarily ability to deepen the strategic partnership with the Philippines. The most feasible way to achieve that is for China to continue making inroads in Indochina, particularly via the high-speed railroad its building through Laos and Thailand and its entrenched economic and political influence in Cambodia (which just officially joined the SCO as a dialogue partner this month). By being so successful in the countries west of Vietnam, Beijing asymmetrically opens up a ‘reverse front’ of competition against Hanoi, putting the latter on the strategic defensive for once and chipping away at the sole competitive focus it used to attached to the South China Sea. Faced with rivalry in its literal backyard (and where its military used to freely operate during the 1980s), Vietnam now must divide its attention between the East (South China Sea) and West (Indochina), thus giving it relatively less mobility in the South China Sea than it previously used to have prior to China’s successes in carrying out its southern mainland shift. Vietnam joined free trade zone with the Russia-led Eurasian Economic Union earlier this year. Along the lines of how Vietnam’s anti-Chinese activity in the South China Sea could be curtailed, one must recall the influence that Russia has over the Southeast Asian country. 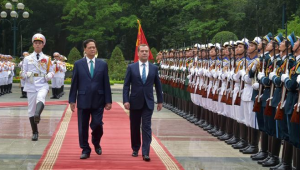 Vietnam values its relations with Russia to such a degree that it refused the American order for it to limit its military interactions with Moscow, and both sides have alsosigned a free trade agreement under the auspices of the Eurasian Union. From these established facts of friendship, one can then proceed to the logical conclusion that Russia holds considerable weight in Vietnam’s strategic planning, and it thus becomes possible for Moscow to capitalize upon this in aiding its Chinese ally’s concerns as per its tacit responsibility under theRussian-Chinese Strategic Partnership. It’s not predicted that Russia can entirely restrain Vietnam from carrying out anti-Chinese policies in the region, but it could at least use its diplomacy to act as a counterweight to American influence over its decision makers and possibly act as a crisis mediator in the event that a naval clash one day occurs with China. Overall, Russia’s role is that of a trusted, moderating influence that can restrain Vietnam from making hasty and overly rushed (and American-influenced) anti-Chinese actions that unexpectedly destabilize the situation even more than it currently is. The Japanese public isn’t happy about their government’s remilitarization push, and tens of thousandsof citizens have vocally protested against it in an unprecedented pushback over the past year. The government doesn’t appear to be fazed by their rising anger, and with the next elections scheduled to be held by 2018, it seems as though they’re counting on the public losing interest before then and not prioritizing the topic as an electoral issue. Still, Japanese society has never been this mobilized before, as the entirety of the country understands the historic choice being imposed on them by their leaders and recognizes the far-reaching consequences that this entails. It could turn out that the public pushback is strong enough to call early elections that might unseat the government, especially if the public becomes incensed by any possible Japanese military deployment to the Philippines, and even more so if this results in any casualties whatsoever at the hands of Mindanao-based Wahhabi terrorists. Another thing to mention is that the ‘beauty’ of democracy is such that domestic and international issues can easily be manipulated by outside forces (ergo why the US engages in regime change and ‘democracy promotion’ across the world), indicating that China could potentially attempt to influence the debate to its favor via soft and covert means in response to American efforts to do the same, thus leading to some interesting informational scenarios. It might seem far-fetched at the moment, but if Russia and Japan reach some sort of diplomatic breakthrough (possibly as a result of years-long secret negotiations a la the US-Cuban ones), then it would change the entire calculus for the US’ P2A. This is because Japan is the main pillar of the whole strategy, since it alone is the only country in East and Southeast Asia with the capital and military potential to present a sizeable headache for China, and it’s also the only state with a leadership history (Fascist Japan) that stretches into both theaters. If it were to reach some sort of understanding with Russia and then begin trying to play it against the US (the same hand that Israel is trying to play at the moment, but for different reasons), then it would create a multitude of strategic uncertainties for the US and throw the P2A into jeopardy. Therefore, this is the absolute last scenario that the US wants to see happen, and it won’t hold back any option to prevent this from occurring. Keeping Russia and Japan apart is just as, if not more, important to American grand strategy at the moment than keeping Russia and the EU divided, and if this state of affairs changes, then there’s no doubt that it’ll elicit a fundamental change in the US’ position and unexpectedly throw it on the defensive in a region where it had long taken its dominance for granted. The US’ plans for constructing an Asian NATO against China are predicated on the overly confident belief that loyal Filipino proxy Benigno Aquino III or his potential successor Manuel “Mar” Roxas II will win the presidential elections next May. The Diplomat, however, thinks that this might not be as assured as the US would like to believe, as oppositionist Jejomar Binay might put up quite an electoral fight with his populist platform. It’s still too early to tell how things will play out, but it’s worthwhile for one to read the publication’s article, since it puts into context exactly how different Binay’s foreign policy towards China might be. In relation to the treatise, he would essentially reverse the current President’s policies by normalizing ties with Beijing and jointly cooperating with it in the South China Sea, and there’s also the possibility that he and his supporters would find the Enhanced Defense Cooperation Agreement recently enacted with the US as illegal and thus overturn it. This momentous policy shift would neutralize the very reason for the Asian NATO and remove the US’ ability to use the island chain (and especially Palawan) as its forward operating base against China. Suffice it to say, the US has a real stake in the outcome of the forthcoming election, and it will likely resort to uncouth means (a dirty information war or worse) to manipulate the voting process and guarantee to the best of its ability that its preferred candidate comes out on top (or that the opposition can be bought off). But, as nothing can be certain, it mustn’t be discounted that the US could be handed a sobering electoral surprise that totally takes the Pentagon off guard and forces it to furiously scramble various improvisations to salvage its defeated P2A. 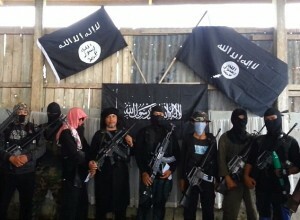 The Philippines-based terror group the Black Flag Movement (pictured) – known as the Khalifa Islamiah Mindanao has declared its support for ISIS. The other contingency that could occur to offset the Asian NATO’s creation in the Philippines would be the explosion of terrorist mayhem coming from Mindanao. This large southern island has been home to a separatist movement for decades, but regretfully Wahhabi terrorist elements have hijacked the cause and discredited it in the eyes of the global public. The resultant terrorist campaign of the past years has created a situation where the country felt compelled to seek increased American military assistance, a precursor of sorts to the P2A. While a renewed spike in terrorism could obviously serve as a pretext for deeper American military involvement in the Philippines (and a convenient smokescreen for ‘justifying’ an anti-Chinese buildup there), it could also drag the US into a potential quagmire and distract from its sole anti-Chinese function in constructing the Asian NATO. Not only that, but the Philippines’ foreign military partners might be scared to commit troops there so long as the violence is raging, as even if they remain confined to their bases (like the Japanese are predicted to be if they enter the country), the terrorists could bring the battle to them if they feel that the foreign forces are qualitatively benefitting the Filipino military through training and/or arms (which Japan already says it wants to provide to the country). It’s absolutely certain that the Japanese public has no stomach for military causalities incurred abroad, so even the death of a single serviceman in the Philippines, no matter if it’s due to a terrorist attack against their base or an in-field battle, could lead to a nationwide near-revolt that demands the immediate withdrawal of military forces and potentially a snap election to return the Constitution back to its peaceful intent. The effect of American military casualties is less clear, as they’d likely be special forces and their information accordingly won’t be made public in the event they were injured or killed (except if an internal source leaks the information). Even so, American public opinion has no effect whatsoever in altering the Pentagon’s P2A plans, but the same can’t be said for other countries like Australia, for example, which could also get sucked into the Mindanao mess via the very tempting ‘logic’ of mission creep. In any case, an upsurge in terrorism in the Philippines would disrupt the island’s primary function of gathering a de-facto coalition of anti-Chinese militaries and lead to unintended consequences that could bode very negatively for the future of the said organization, as it would increase the real costs of participation and potentially scare away prospective member states from setting up base in this geo-critical but terrorist-plagued island chain. It’s no secret that the US wants to interrupt China’s peaceful rise, and in doing so it’s stoked the fire of regional rivalry in the South China Sea. The purpose behind this is twofold: (1) insert seemingly irreconcilable political differences into the economic relationship between China and its ASEAN partners (like what the US has tried to do between Russia and the EU with Ukraine and Crimea); and (2) provoke China into militarily responding to provocations from Vietnam and/or the Philippines to confirm the self-fulfilling cycle of regional suspicion that Washington has tried to foster (just as it’s tried to do with Russia in Ukraine). The fulfillment of this double-headed objective is meant to ‘justify’ the push to craft an institutionalized entity that will essentially serve as an Asian NATO for countering China. 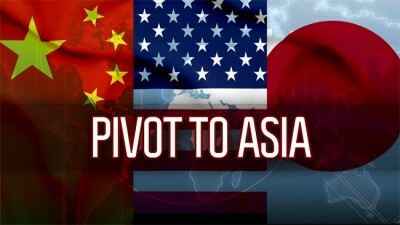 It’s envisioned that this organization’s core deployment will be centered on the Philippine islands due to geostrategic and political factors (per the latter, that the government is entirely under the influence of the US at the moment), and that it’s other two primary members will be Japan and Vietnam, both of which have the most heated island disputes with China. But, this entity is also expected to potentially include two other auxiliary members that can buffet its strategic potential, and these are India (in the direction of mainland Southeast Asia) and Australia (against Indonesia, the simultaneous containment of which alongside China was explained in the first section). Everything doesn’t have to be that way, however, since there are a multitude of possible scenarios that could occur in order to interrupt this process and possibly even lead to the dissolution of the Asian NATO before it ever has a chance to be formalized. In a nutshell, these are the explosion of regional conflicts that offset the focus of India (in Myanmar, Nepal, and the Seven Sisters) and the Philippines (in Mindanao), and the skilled application of Russian diplomacy in Vietnam and Japan.China can also play an active part by pushing its strategic interests deeper into the South Pacific and Indochina, which would serve to divert Australia and Vietnam’s attention from their previous sole focus on the South China Sea in regards to ‘containing China’. By shifting the initiative, China can make regional inroads while at the same time throwing its rivals off balance by unexpectedly flipping the dynamic against them in their home areas (the literal reverse of what they’re attempting to do to China in the South China Sea). Also, democratic factors in Japan and the Philippines could weigh heavily in changing their respective governments’ outlook towards this dangerous situation. Whichever form it ultimately takes, it’s clear that there are definitely a plethora of situational options available, some of which can be directly influenced by China and its strategic Russian partner, to slow the process of Asian NATO formation, and that it can confidently be fought back against under the proper circumstances, with the cultivation of a dedicated enough level of political will, and through a little bit of ‘geopolitical luck’ (as unethical and coarse as that may sound in relation to Mindanao, Myanmar, Nepal, and the Seven Sisters).